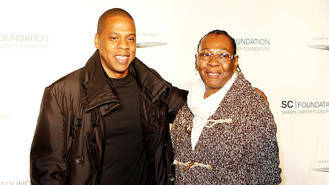 JAY-Z's mother has urged fans to "love who you love" after 'coming out' as a lesbian on the rap icon's new album. The Empire State of Mind hitmaker, real name Shawn Carter, dropped his 13th solo release, 4:44, on Friday (30Jun17), and on the track Smile, he reveals his mum, Gloria Carter, has found love with another woman. Gloria divorced Jay's father, Adnis Reeves, when the musician was just a boy, and in his lyrics, the 47-year-old star admits it took her years to finally live her life out in the open - and he couldn't be happier for her. "Mama had four kids, but she's a lesbian/Had to pretend so long that she's a thespian/Had to hide in the closet, so she medicate/Society shame and the pain was too much to take," he raps. The song continues, "Cried tears of joy when you fell in love/Don't matter to me if it's a him or her/I just wanna see you smile through all the hate/Marie Antoinette, baby, let 'em eat cake". Gloria herself features at the end of the tune, which samples Stevie Wonder's Love's in Need of Love Today, and recites a poem about "living in the shadow", asking, "Can you imagine what kind of life it is to live?". "Living in the shadow feels like the safe place to be/No harm for them, no harm for me," she states, as the song comes to a close. "But life is short, and it's time to be free/Love who you love, because life isn't guaranteed". Gloria's revelation has received praise from members of the LGBTQ (lesbian, gay, bisexual, transgender and queer) community. Sarah Kate Ellis, President and CEO of the GLAAD civil rights advocacy organisation, applauded the matriarch and thanked JAY-Z's mum for her positive impact on those who may be struggling with their sexuality. Smile isn't the only highly-personal song on 4:44 - JAY-Z also addresses allegations of his infidelity, publicly apologising to his wife Beyonce, the mother of his three children, on the album opener Kill Jay Z and on the title track. Adele has given fans an insight into her personal life – and it involves watching Love Island with her husband. Foo Fighters' new album will feature a rumoured collaboration with Adele and some of pop's biggest names. Rihanna's father has warned her new boyfriend to “buckle up” while dating his daughter. Little Mix have become the first girl group to win the Ticketmaster Best Live Act at the Nordoff Robbins O2 Silver Clef Awards. Rod Stewart and Penny Lancaster have used their vow renewal ceremony to help the survivors of the Grenfell Tower tragedy. Kelly Clarkson is to release a Christmas-themed children's book later this year (17). Matt Terry has teamed up with Latin producers for his debut album. Thomas Rhett has confirmed he has recorded a duet with Selena Gomez.